Facts and information about the History of Clothing and regalia of Native American Indians and their Hair Pipe Breastplates. The adornment known as a Hair Pipe Breastplate is a familiar item worn by Native Americans. 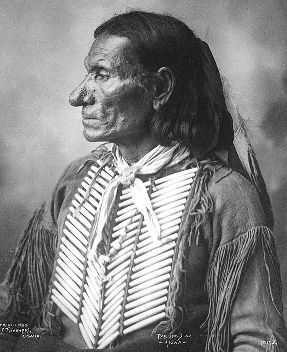 Hair pipe breastplates were invented by the Comanche in the 1850's and was adopted by many other tribes of the Great Plains including the Crow, Sioux and Assiniboine tribes. The term 'Hair Pipe' is used as the name for long, slim, hollow, cylindrical beads that were used as hair decorations, chokers and breastplates. Hair pipe breastplates were made by stringing rows of the long beads on buckskin cords to form an elaborate breastplate. Hair Pipe Breastplates Fact 1: The Native American fashion for wearing this type of breastplate originated by accident and by the Native Indians determination never to waste any item. Hair Pipe Breastplates Fact 5: The use of the stems of Corn Cob Pipes as hair decorations led to the origin of the name "Hair Pipes"
Hair Pipe Breastplates Fact 6: Ingenious use of the stems as a type of bead led to the development of other ornaments such as chokers worn by the Osage and Otoe tribes and the famous breastplates worn by the Native American who inhabited the Great Plains including the Kiowa, Sioux, Crow and Assiniboine tribes. Hair Pipe Breastplates Fact 13: In the 1990 movie 'Dances with Wolves' a hair pipe breastplate was used in a trade exchange between the hero and his friend 'Wind In His Hair'.